"112" which will connect to police, fire, health and other helplines through an Emergency Response Centre (ERC) in the state. Union Home Minister Rajnath Singh at the launch of the Single Helpline Number. 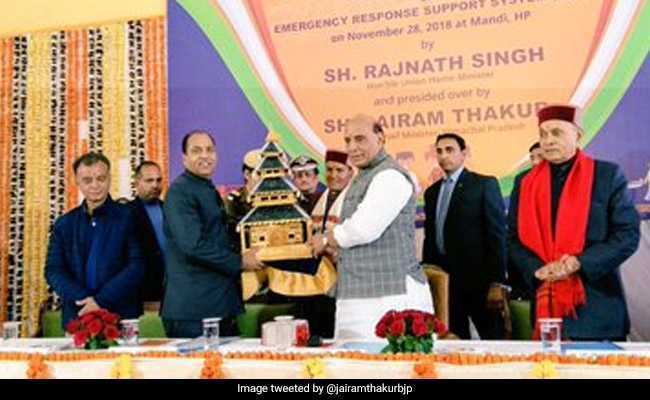 Himachal Pradesh on Wednesday became the first Indian state to launch a single emergency number "112" which will connect to police, fire, health and other helplines through an Emergency Response Centre (ERC) in the state. "The ERC has been integrated with police (100), fire (101), health (108) and women helpline (1090) services to provide emergency services via single emergency number 112," said a Union Home Ministry statement. The service is part of the Emergency Response Support System (ERSS) which includes a '112 India' mobile app integrated with panic button of smartphones and ERSS state website for ease of citizen in availing immediate assistance. "Ensuring safety of women, a 'SHOUT' feature has been introduced in '112 India' mobile app to seek immediate assistance from registered volunteers in the vicinity apart from the immediate assistance from ERC. The SHOUT feature is exclusively available to women. To increase the effectiveness of emergency response, the ERC has also been integrated with location-based services provided by telecom service providers," the statement read. It said the '112 India' mobile app will be subsequently rolled out in all states and Union Territories to help people across the country access the unified emergency services. Launching the ERSS project, Union Home Minister Rajnath Singh appealed residents of Himachal Pradesh to download '112 India' mobile app available in App store of Google and Apple.